In this message the Spirit of Jesus leads L. in her writing about the 14 Stations of the Cross. L.: O God, 2,000 years ago, You were standing in front of Pilate to listen to the words of slander and accusation against You. You were silent, in the meekness of the Holy One, with the attitude of a mighty king. O God, everything that happened was a mystery from the start, because everything was a plan that God the Father had arranged. With Your acceptance and Your self-sacrifice, You had to bear the sins that were committed by mankind, in the same way that You have to bear the current situation, but through the phases, there were hidden signs that Jesus Himself had shown to the people who had power in society, the people who had power in every era. Jesus was silent to listen to the sentence given by the people who were elected. Were these elected people acting with justice or not? Was there wisdom in their sentence for a soul, for a person who has to be in court, awaiting judgment? O God, in our world, injustices abound. The people who are in power abuse their authority. They only live for their own glory. When a person is standing in front of them, falsely accused of committing a crime and awaiting judgment, will the sentence be just? Will there be righteousness and justice? God had seen that everything started with mankind, the offenses that mankind committed, the violations of the commandments, from the people who are in power in society, to the people who are in power in the Church. With all these injustices, can those who are in the position of judging a person look at the condemned person with impartiality, with justice, as God had taught in the Gospel? O God, our world is full of wickedness. Though the people who are in power know that a person is innocent, but for the sake of their position, they will look the other way and they will ignore the innocence of that person. Even though they know that a person is innocent and is being falsely accused, but because of their status, because of their greed for fame, because of the glory and the money, they will not look deeper into the matter that would help them make a decision that would be life or death for that person. They have abused their authority and they have overlooked the innocence of the person who is being falsely accused by the other brothers. Even the Apostles were stoned and were killed by the people in power. If it is up to God and His Power, He would protect the righteous people against the wicked ones, who had abused their authority, and who had allowed the stoning of the righteous ones (1). O God, Jesus had to face the injustices of the court on earth. He is looking at the people who are in power today, who are abusing their authority in the same way as in the past, and in even a more cruel and wicked way. Many innocent people were killed. Many innocent people were falsely accused. Silently, with His head bowed, Jesus had accepted the sins of those in power, for these people to know that their sins will one day be brought into the light. Jesus reminds those who are in power that to be able to show justice for everyone, they need to take a look at their own sins; they need to clearly differentiate between right and wrong, between justice and truth; they need to accomplish the duty of a person who has power in society, in the Church, and in every class, for them to live with righteousness, for them to know the truth that Jesus had taught, and for them to know the truth about Jesus, who was condemned for the sins of mankind 2,000 years ago. 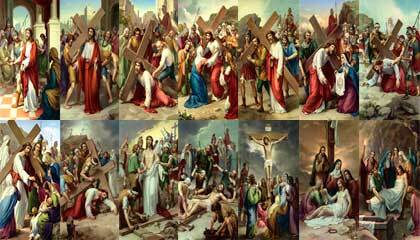 Today, God is allowing L. to report the 14 Stations of the Cross. Each Station of the Cross is a sign from God, pointing out clearly the sins of each role, from each person in today’s society and today’s world, which are also the end times when Jesus will come to the earth. God is inviting those who have power, in any rank of society as well as in the Church, to live with righteousness and to live with justice, for them to receive justice and reward from God. This is the invitation of God in this 2013 season of Lent. Jesus had received the sentence. The soldiers took Him away and tied Him to the pillar. The pillar that Jesus was tied to still exists today. I had the opportunity to see the pillar that Jesus was tied to 2,000 years ago. It is in a room for everyone to come to see. In this room there is an altar for the celebration of the Mass, as a reminder to the pilgrims who are on a pilgrimage to the Holy Land, and for them to be able to see the pillar that Jesus was tied to, to be scourged by the soldiers. To this day, the vestige is still there. Jesus heard the false accusations and the requests of the crowd. He was silent. He accepted the sentence with a sorrowful heart. With Love, He fully accepted the scourging upon His Body, for the sins committed by the people who are not even aware of the sins that they are committing. He endured the bitterness, for He had seen the cruelty that mankind has for each other, using their authority to ill-treat each other, in their rivalry, in their deceit. He had endured the scourging for mankind, for each person in that period of time, and for each person in this period of time. People are still looking for ways to kill each other; they are still looking for those cruel ways to harm the body and the soul of each person. They do not see their actions as wicked, as injustices. They do not recognize the sins that most tend to commit. These sins are the scourging that Jesus had to suffer in His Body. In the hands of those who scourged Him mercilessly, He endured a scourging so atrocious that His flesh was torn off. There was no other greater torture than the scourging He had to endure for mankind. In His humanity, He would not have been able to endure the atrocious scourging. In His divinity, by the divine grace from heaven, He was given the strength to endure the scourging and the other tortures that were planned for the Passion, in which He had to endure each phase, for the meaning of the sins committed at that time as well as in this time. In each family, from the parents to the children, if they have not found the truth from the commandments of God, they will ill-treat each other through their ways of talking to each other, through their actions toward each other, from beatings to emotional sufferings. There is rivalry, there is envy, there is jealousy, there is sulking, there is fighting and many others harmful acts done physically. There are actions that were influenced by evil in certain families, and the young children were exposed to all the wickedness in their young age. These young children, because of what they had seen in their childhood, when they grow up, they will become violent, they will become the children who carry the evil of a society, of a family, and they become criminals, so where will their lives end up? Jesus had clearly seen everything, so the scourging that He endured is to remind us to look at the problems that are happening to each family, to each person, because of the violent behavior of each person. They cannot control their ego and they end up ill-treating each other, causing the family, themselves, and society to commit many sins which they do not even know are their own sins. Jesus had endured to teach each family, to teach each person, that when they encounter the challenges that they think they cannot handle, then they only need to look at the Cross of Jesus Christ in the Second Station, to see the beatings He had to endure. He offered His Body to accept the sins, to bear the sins of mankind, and to ask God the Father to forgive all the offenses committed by mankind, whether involuntarily or voluntarily. That was the meaning that Jesus reminds each family and each person, that whenever they have difficulties in their family life, emotionally or physically, to remember about the things that they can do. Live life with calmness, with quietness, with prayers, and always with trust in the Love of God, then everything will be arranged in the way that God had planned for people, to teach people to accept with calmness and to pray when facing certain situations, so that when the problems occur, they will understand their positions and they can pray to give the other party an opportunity. If every work is done in justice, then God will bless that family, that person, in a very special way. He had said, “Ask, and it will be given you; seek, and you will find; knock, and it will be opened to you.” If people truly believe in God in any situation, then God will definitely answer each individual. This is the promise from God ever since for those who trust in Him. If people truly look into the Gospel and are able to know about His statutes and His commandments, they will find and discover the magnificent graces and the greatest gift that God had reserved for mankind ever since, and it was He who had offered Himself to bear and assume the responsibility for all the sins of mankind in front of God the Father. From the tortures His Body had suffered, He no longer had the strength left to withstand the scourging. His Body was covered in blood, covered in deep wounds. He could no longer see clearly with His eyes, for Him to stand up to walk the remaining stations. Jesus was tortured so atrociously that His Body was all bloody, and even His eyes were so swollen that He could no longer see what was in front of Him for Him to take a step. Again, if not for His divinity, if not for the divine support, He would not have been able to continue, to be able to carry the Cross; He would not have been able to continue to endure the stations that He had to endure, under the heavy Cross, that made Him fall for the first time. Falling for the first time had deep meanings. Jesus wanted to remind each person in their lives, from each individual, to the clergy, to the Church, to every class in society, to the whole world. If people do not seek the truth that Jesus had left to the world, then they have committed sins, whether involuntarily or voluntarily. People go through the following phases in their lives: they start with sins, they start to fall, then starting with their own actions, they practice things that are sinful, and they end up hurting others as well as themselves, and even hurting the roles that they have. This is a reminder to people when they transgress the laws (2). Jesus left the teachings to people, but because of their mistakes, they have fallen for the first time in life. This is also a sign if they recognize that they have made a mistake, and they stand up to take the next steps. Jesus had seen the journey of each person on earth. He understands the situations people face. He understands the feelings of each person. Because of the situations, people might have made serious mistakes on purpose, in their roles and in their lives. They do want to stand up, for them to come back. If Jesus did not fall for the first time as an example, then people would not have been able to see their mistakes, for them to continue to stand up, for them to continue to change, and for them to come back to the truth that Jesus wants. Jesus’ fall for the first time is for the sins that people start to commit in their actions but do not recognize. In life, people fall so many times. For that reason, Jesus’ painful fall for the first time was because of sins. 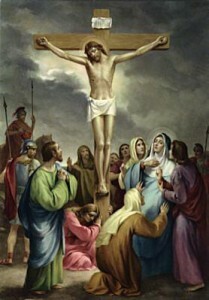 Then He stood up to complete the Way of the Cross that He had accepted, as His noble sacrifice for humanity. O people, who are living in sin, and who are living in the ways that are sinful, listen to the reminder from Jesus in this year of 2013. The Church will remind people of the Cross in the coming days, in this season of Lent. 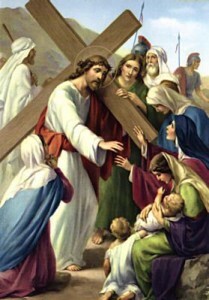 The Fourth Station of the Cross is about the moment when Blessed Mother met Jesus carrying the Cross. Blessed Mother is the Mother of God. She is like any other mother on earth, so when She saw the tortures, the agonies, and death awaiting Her Son, Her Heart was pierced with sorrow. Mother Herself also walked the Way of the Cross, along with Jesus. Mother is the Mother of God, Mother is the Mother of mankind, but 2,000 years ago, Mother lived a normal life, just like other mothers on earth. She lived close to Her Son, She loved Her Son, She took care of Her Son. Everything that belonged to the Son also belonged to the Mother, and everything that belonged to the Mother also belonged to the Son. From Her love to Her way of taking care of everything, Mother was the same as any other person in the world today. When Mother saw Her Son suffering, carrying the heavy Cross on His shoulder, Mother wanted to carry the Cross on Her shoulder along with Her Son on the Way of the Cross, but everything was arranged and everything was planned by God. By divine grace, Mother had received revelations regarding the entire journey that Jesus had to take. Mother had accepted to collaborate in the Passion of Jesus, but in Her humanity, the mocking words of the soldiers and the false accusations of the crowd deeply grieved Her. Her soul and Her body indeed suffered. Her Heart was pierced by a sword when She saw the Son whom She had carried in the same way as any Mother on earth. She suffered in Her flesh and in Her bones, in the same way as Jesus suffered. Mother and Son looked at each other, with a deep understanding from a human perspective, but from a heavenly perspective, they had an even stronger understanding, a strong collaboration, for the Father’s Will must be fulfilled in Jesus according to what was received and revealed when the Word was made flesh. Those were the signs that are left to this world today. In every family, there are adversities, such as in the situations where there are children who are sick and face death; such as in the situations where the mother has to sacrifice to accept the consequences of the crimes committed by their children, grieving and suffering over the sentences given to their children for the crimes they had committed. These are the sins that Jesus had to bear, and He is also the example for the children who live in sin, the children who do certain things without thinking, without praying. These children end up having to face the consequences of their evil actions; they face prison, they face execution, and they made their mothers suffer. This is unfair to the mothers on earth, but the children do not think, they do not know that their actions are wrongful, they do not know that they are following the darkness, they do not know that they are following the ways of the world, they do not know that they are doing evil things, causing their mothers to have their hearts pierced by a sword. This is in regards to the mother on earth. As for the Mother in heaven, She grieves when She sees Her children living in sin, unaware of the grief they cause to their mothers on earth and to their Mother in heaven. She grieves seeing the world today, and Her tears, Her tears of blood, are calling and inviting humanity to come back to God, through this Fourth Station of the Cross, calling and inviting each mother to collaborate with God, to pray for their spiritual life and to pray for their children. Even if the children have sinned, but if they are still alive, they still have the opportunity. The mother can give the children the opportunity and the children can take a look at their own mistakes for them to come back to righteousness, for them to come back to pay their debt of gratitude to the mother who had to suffer for their actions, through the different phases and situations in their lives. In this Fourth Station of the Cross, Blessed Mother is reminding the mothers on earth that in this life there are always painful situations where mothers have to worry for their children, where mothers have to love their children. O mothers on earth, take a look at the examples of the Way of the Cross that Blessed Mother and Jesus had walked, and collaborate in your present lives, for you to learn to entrust, for you to know the responsibilities of a mother, for you to know the responsibilities of taking care of your children, of teaching your children righteousness from a young age. The women who are mothers need to understand the sacrifices they need to make, and they can learn from the example of our Blessed Mother. These women need to pray, and they need to live a life worthy to be mothers on earth so that their prayers will be heard by God, for God to forgive their sins and the sins of their children. Jesus had shown the example of His sacrifice for the world in this Station of the Cross. This is the Fourth Station of the Cross. Jesus has allowed me to report this for all the people who are listening. I hope that these reminders from Blessed Mother will be heard by the mothers on earth, for them to accept the plan arranged by God; for them to pray to God, asking God to walk with them, asking God to come to them, to help them to be resigned and to help them to forgive their children; for them to bring their children back to God, in the love that Blessed Mother had shown to the world; for them to continue to live a righteous life, making sacrifices and praying in the remaining days of the century. The soldiers then saw that Jesus had been weakened by the tortures and that He did not have the strength to carry the heavy Cross for the rest of the way. There are deeper meanings in this. 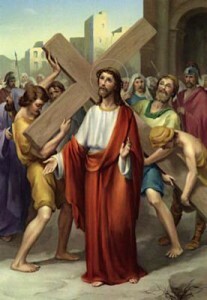 Jesus, in His humanity, could not have stood up starting from the First Station though He had tried; because of the scourging; because of the taunting and mocking words; because of the beatings from the soldiers for Him to keep up with them – but in His divinity, He was determined to walk the Way of the Cross. Jesus is reminding us all that the works that He had accomplished for the world were not only for His sheep or only for the people who follow Him, but for all of humanity, for each soul, for those who are non-Catholics, including the people who have not yet recognized God, who have not yet known God, and who have not yet accepted that it was Jesus Himself who had come to earth. There are still people who are non-Catholics, but Jesus wants to remind us that He suffered for the whole world, for the people who have not yet recognized and who have not yet found their way to God who is the Father. So for Simon to be a non-Catholic is not a coincidence. It was arranged in the plan of God, for the non-Catholics and for those who do not yet know God to have the opportunity to share in the Cross, to help Him. This is for the people who do not know Him, the people who do not accept Him, and the people who refuse Him, for them to see that He also bore their sins. For their sins, Jesus had to suffer, and yet they are ungrateful, they are indifferent, and they still refuse God. At that time, as well as in this century, Jesus continues to put up with the pride, with the lack of reverence, with the hardened hearts of those who sin and continue to sin, treating God in the same way today as they had treated God in the past. They still have not recognized God as Father. They still have not recognized their mistakes, which He had to bear. So whether they were aware or not, Jesus had suffered for the non-Catholics, and for everyone in the world. Those were the reasons for Simon helping Jesus carry the Cross, though Simon did not recognize the sacrifice that Jesus did for the non-Catholics at that period of time, and in this period of time. Because he was forced, Simon had to help Jesus. Simon did not think that it was Jesus who had opened the way for people to step in. For the sins of mankind, Jesus had to carry the heavy Cross on His shoulder, along with a non-Catholic person, for them to see the Love that God has for mankind. He had suffered so much for the people who were non-Catholics, who opposed, who did not believe, who refused, through the centuries, for them to clearly see the truth today (3). The meaning of the Cross is forever Love. Love for humanity. Love for each soul in this world. Today and at this moment, Jesus is reminding us that He is giving us many opportunities to come back to Him, through many forms, through the events that people in the world are able to see. Especially when speaking of the Divine Mercy. Jesus had healed so many souls, so many diseases in this world, even for the people who are non-Catholics, even for the people who do not believe in Him. They are His children, for whom He had carried the heavy Cross, with the help of Simon. He had healed every person who truly believed in Him, and anyone coming back to Him will receive salvation and forgiveness in the remaining days. 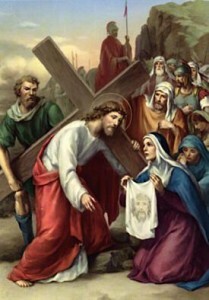 At the Sixth Station of the Cross, Jesus wanted everyone to be able to see the courage of Saint Veronica. This act of courage was mentioned in the history of His Passion. Saint Veronica had used her veil to wipe the Blood that Jesus had shed for mankind at that time and in every era that God had come to the world, as planned. (4) God had seen the heart of every person at that time as well as the heart of every person today. Although the number was quite small, there were still a number of people who listened to the word of God, who accepted the laws of God, who kept these laws, and who practiced the commandments that God had given to mankind. In every era, though the number is quite small, there are still a number of people who are virtuous, who are holy, and who are righteous. So, on the way where Jesus had carried the Cross, He wanted to lift up the people who believe in God, He wanted to lift up the good works that they accomplish, the practices that they do according to the teachings, according to the commandments that Jesus had left for mankind. 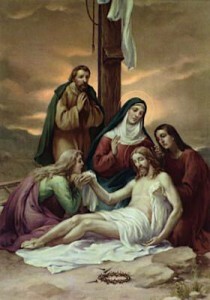 Through Saint Veronica, Jesus praised the souls that live righteously, the people who live a life helping others, helping the brothers in Christ, in a spirit of love, sharing their understanding of God, sharing their recognition of the Love from God, sharing the recognition of the signs from God, to all the brothers in Christ, in society, in every class, for everyone, everywhere, to receive Jesus with courage, to accept to testify for Him, to bring His Good News to the world. Jesus emphasized that those people are the priests whom He had called, from the beginning till this day. They are the people who have sacrificed their whole lives to belong to the Church, to serve God, to bring His words, to bring His Truth to the world, to mankind. Through the sacrifices of the people whom He has chosen, through their courage, Jesus praised them as He praised Veronica. Jesus sees the deeds of the good people in this society. He is the Just One. He sees the justice in this world, though there are certain offenses committed by those who are in the ranks of the clergy, but there are also those who truly live a life of sacrifice for the truth. Through the praise to Saint Veronica for her courage, He also praises the children whom He has chosen who have truly lived according to His plan and His laws. They include both the clergy of the Church and the laity. 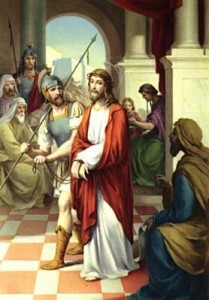 Jesus continues to remind the people in today’s world to continue to have the courage to keep their faith, to continue to testify to the truth, to testify to their recognition of sins, to testify to the forgiveness they had received from God, to be the people who are the witnesses of the blessings from Jesus, right from the beginning. Jesus wants to remind the world that though the number of the righteous people is quite small, He still hopes that the whole world will eventually recognize the flame that has started, for the people to keep the flame burning, for the people to truly come back to Him, to receive forgiveness for them to be worthy to receive the graces that through His Passion Jesus had brought to the world, which are happiness, peace and life, for mankind to be changed and to be renewed. This is the reminder from Jesus through the resurrection of every rank in the world, which includes the Church, the clergy, the sheep of God, to have the courage to stand up for the truth, to speak up for the truth with their brave actions, and to testify, for Jesus to be in them, for Jesus to be with them, for them to help the brothers who are living in sin to be able to see the Light of Jesus, for these brothers to come back to Him. Jesus had to endure so much that he could no more. Jesus had fallen to the ground a second time. He wanted the people to be able to see that in the life of each person, though they want to find the light of the truth, they will fall many times, because of their situations, because of the way their thinking is affected, because of money, because of fame, and because of all the lures that are surrounding them on earth. Every person has in them these tendencies to fall for certain enticements in their present life. They are attracted to fun; they are attracted to the pleasures that each person enjoys on earth. Even when they know that these pleasures are wrong, they still fall for these pleasures, because of their situations, because of the lures of money, because of their jobs, because of their desires for the materials in the world. They know that they will have to pay a price but they still pursue the pleasures that they desire. Their hearts want to come back to God but at the same time, they want to follow their own ways. They are in a position where they are wavering on what would work out best for them, and there have been so many souls who have been lost, living in this way. When they encounter difficulties in life, when they face days of sufferings, it is at those moments when they are suffering the most, when they have no other place to run to, that they come to God, and it is right at those moments that God comes to them. He will not ignore the opportunity when they come back and pray to Him. Though He knows that people tend to betray, though He knows that people are not sincere, but with the Love that God had sacrificed for them, through each adversity, through each phase in life, He continues to support them when they truly seek Him. Though He knows their repentance is short-lived, but He still helps them and He still supports them emotionally, giving them the opportunity to see and to recognize His Love for them. He had offered His own Body to bear the sins of each soul, and He was able to also see the journeys of each person, falling time after time. If people continue to live their life without recognizing the truth, without deciding which way to take, which grace to receive, and which is the worship that is legitimate in a life worshipping God, then they will keep falling, over and over again, in their lives. These are the falls of Jesus on the Way of the Cross. Since He had known about the life of each person, He had accepted the sins from the people who have fallen, and who have betrayed Him many times in life. Because of love, because of His promises to God the Father, He had endured everything, for mankind to have the opportunity today to receive the forgiveness from God, many times in life. This year, Jesus is going deeper into the issues of this century to remind the people on earth, that if they are living in a situation where they keep falling, that they have to stand up to free themselves from the situations where they are being lured by money, by fame, by the sins that surround them, preventing them from seeing the truth. Jesus is showing them that because of them, Jesus had fallen many times, but He still forgives. God still forgives the people and hopes that they will see their own sins, for them to come back to Jesus Christ, for Him to forgive them. He also reminds them of His Divine Mercy, the last salvation for mankind, for mankind to come back to the Divine Mercy of God, to recognize the true Love of God, for them to receive the forgiveness in the remaining days, through Divine Mercy. O Jesus who did not think of His own sufferings but instead stopped to console the children of Jerusalem. 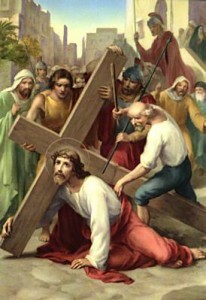 In the Eighth Station of the Cross, Jesus speaks of the Cross that He carried on His shoulder; the Hour that was approaching, the Hour when He had to accomplish the mission which He had chosen, to redeem the sins of mankind. He was concerned about His children at that time, and He is concerned about His children in today’s world (5). There are still those who could see Jesus’ sufferings through the Cross and the deeds He had accomplished for the world, from centuries ago till this day. He is still concerned looking at the children who truly love Him. In every family, when a father, when a mother is able to recognize God, then the children are the ones who do not live and who do not walk in the way and on the path that each family needs to in this life. (6) There are still families in which the children are able to recognize God, to learn of the Good News that He had given. There are also families where the parents are rejecting God and preventing the children from recognizing God. So there are people who come back to God, there are those who reject God, and there are those who oppose the plans that God gives to mankind. God is concerned for those who are seeking and coming to God with tears, for recognizing the sufferings that God had to endure in the past as well as today. Today, in this world, He is still shedding tears for mankind, looking at mankind from the Cross. He had sacrificed and He had suffered, for the people to be able to find their way to the truth, for the people to be able to find their way to Love, for those who are fathers and mothers to recognize God, to persevere, and to stand firm in their faith. When the parents have truly recognized God, they need to be patient with the children; they need to teach the children, they need to help the children to recognize the Love of God. That is the duty and the responsibility of each family to help their children recognize God. If each person acts in their own ways, then there cannot be any miracle, but if they truly believe in God in their prayers, and they follow the commandments that Jesus had given, then the miracle will definitely happen. God will definitely bless the fathers and the mothers for them to persevere, for them to give to their children the opportunity, for these children to see the example of their own parents and to come back to God. Though the hearts of these children are hardened, but one of these days, when they have to face challenges and sufferings in their lives, they will look back at the virtuous lives of their fathers and their mothers, and that will be the moment when these children feel that they want to come back to God, that they want to look for the truth. 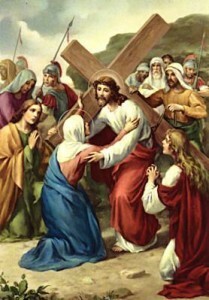 This truth is the truth that God wishes for, through the Eighth Station of the Cross, when He looked at the women of Jerusalem, to remind those who are fathers, to remind those who are mothers, to guide their children with patience, with perseverance, in prayers, and in living a life practicing the teachings of God; to be an example to the children, to give the opportunity to the children for them to come back, for them to know the teachings of Jesus. Through the preachings of the priests, who have the responsibility to evangelize, remind the children to learn, to go deeper into a spiritual life, for them to be sanctified, for them to be transformed by God. God will give in a special way to those souls who truly open up, who pray and who trust. There is nothing that God cannot do. God gives back to those who have done righteous deeds. These are the reminders from God in this Eighth Station of the Cross. O Jesus, Mount Calvary was near, You had lost a lot of Blood and you had fallen one more time. O descendants of Adam, take a look at your God who had fallen many times, because of whom? 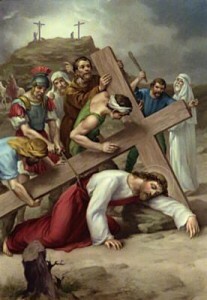 In this Ninth Station of the Cross, Jesus reminds the people that the life of each person is similar to the Stations of the Cross. When people are living with faith: the situations, the ego, the status and the power have caused their faith to be shaken, but their faith has helped them to recognize their own mistakes, to recognize that the injustices do not come from the commandments of God. They could walk away from the sins that surround them, but they do not have the strength to reject fame, to reject money, to reject the pleasures of the world, so they continue to fall into sins, they continue to fall into the passions, and into the pleasures of the world. This is the third time that Jesus had fallen. He no longer had the strength left in His human Body. Jesus reminds us in a very clear way: “O descendants of Adam, take a look at your God who had fallen many times, because of whom?” God reminds that everyone is a descendant of Adam. Because of the sin that the ancestors had committed, the descendants of Adam had to suffer the consequences. To this day, people still live in sin. If not for the salvation from God, if not for the Incarnation of Jesus, then there would have been no way out, and people would not have been able to learn and to follow the teachings. People still live in wickedness and in sin, through so many centuries. The day that Jesus was born into the world, the people had the opportunity to change, they had the opportunity to have the life that God the Father had given to them since the beginning. Through the sufferings that Jesus had accepted for the sake of mankind, He had taught mankind very clearly on how to live, for He had known about the weaknesses of each person. Sometimes, people do recognize the light of the Truth. Sometimes, people do recognize the Love of God. They suffer and they decide to come back to the love that they have recognized, to come back to a spiritual life, to come back to the infinite Love that God had given to mankind, but because of the situations, they cannot free themselves from the chains of the world, a world living in the darkness. So they are still living in sin, they are still buried deep in the passions of the world. Jesus already knew, He had given them the opportunity, as He had fallen for the third time, God reminds and encourages the people who have fallen many times in life, and who are surrounded by sins. If they truly give themselves the opportunity to receive the grace of God; if they truly give themselves the opportunity to receive the forgiveness of God, which they have to seek for themselves to be able to find His grace, through the true Love that Jesus had given on the Cross, then they will be able to overcome the temptations in their life, they will be able to recognize the Love and the Truth of Jesus Christ, from the moment He came into the world to the moment of His Death, and through His Passion today (7). He had suffered His Passion for every sin that the people have committed, for every sin that they are committing, and for every sin that they will commit in life. He reminds the souls who are listening at this moment, to come back to God, to accept Jesus who had died on the Cross for humanity, who had done everything He could for humanity, and who had taken the sins of humanity to the grave. For this reason, every time people fall, they should stand up, and they should know that Jesus is waiting, is reminding, and is inviting each person in this world, in these remaining days. He had given these new messages for the whole world and for everyone to be able to recognize their own mistakes and to come back with the desire to receive forgiveness in these remaining days. Because of the tribulations that will happen in this world, if people do not have these revelations, if there are no prophets to speak of the warnings given by Jesus, then there will probably be no survivor in this world. Because of His Love, because of His great accomplishment through His Passion, He had given the last opportunities for the people to clearly see. He had given His Love to each person, for them to have till the last moments of the days when they will have to face their rebirth in Jesus Christ. If people do not believe in God and if they do not come back to God, then they will not have the strength to face the tribulations that will happen unexpectedly. Where would their souls end up if they do not truly accept God? Where would their souls end up if they do not truly choose Him to come back to the truth? 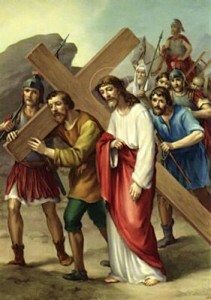 This is the Ninth Station of the Cross that Jesus wants L. to give an account of. O Jesus, when the soldiers were ready to nail You to the Cross, they had stripped You of Your garments to shame You. 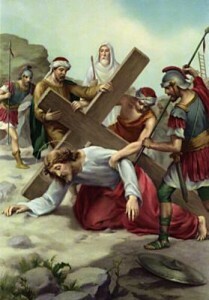 In this Tenth Station of the Cross, Jesus showed that He had accepted everything because of His Love for humanity, and that He had given up everything for humanity, including His garments. Everyone has their garments to cover their bodies, even when they end up in their graves, but it was different for Jesus. He was fully stripped of His garments because of the sins of mankind, and this was the moment which showed how He fully gave His all to humanity. That gesture was for people to be able to see that He had truly volunteered to give up everything for mankind. Though He knew about the sufferings of these last moments, Jesus still allows people to take everything that He could give to them, for them to choose. Even the last piece of clothing on His Body was taken away from Him, which showed everything that Jesus had done for mankind. By this, He had taught to the people at that time and to the people in this time. If people truly seek the truth from God, then they will have to deny themselves; they will have to learn to carry the cross as Jesus had carried the Cross; they will have to accept the challenges, the injustices, the spiritual scourging through the situations and the adversities that each family has to face in today’s society and today’s world. People live in sin, so sin is always present in all situations, which makes it harder for people to recognize that they are living in sin. Jesus had known about this and this was the reason for Him to accept everything, to the last measure. If people truly want to come back to God, they should remove everything that is sinful from their minds and from their consciences for them to come back to the Truth; for His grace to help get rid of the darkness of sin in their thoughts, in their words, and in their actions; for them to truly be the people who come back to Jesus Christ, to the teachings and the Truth that He had given to the world. In this life’s situations, it is not easy for the people to reject the things that they have, as Jesus had taught. There are certain people who truly listen and who want to come back to God, but in their lives, when they are on the way back to the Truth, they have to face certain adversities and situations such as sorrow in the family; the opposition of others; the critics, from friends and from people around them, who are the people whom they had trusted. There are many situations in this life that Jesus had seen and had understood, but Jesus had reminded the people, for them to be able to see that if they truly seek to come back to Him, that if they truly seek to come back to the Truth, then they have to remove everything that comes from their ego, they have to remove everything that is familiar to them, by looking at the sacrifices that Jesus had done with all of His Heart. That is the way for people to truly come back to God, in the way that He wishes. But in today’s world, how many people are able to do that? Even the people whom He had chosen, the people who were to replace Him, to call and invite the sheep of God – even these chosen people are having a hard time avoiding the offenses that they commit in their daily lives. Jesus knows about the weaknesses of mankind, and He sees the offenses that everyone commits daily, but He does not look into the sins of people, for He had removed everything from His Body that stands for every offense that people commit daily. He only wishes that people would be able to see that. If people truly know what a sin is, then they should avoid it, to help their souls, their consciences, and their minds. In the same way, the priests as well as the laity should learn to avoid committing small offenses, and then with the bigger ones, they will learn to recognize these offenses when they trust in God. These reminders are from Jesus, for people to apply to their daily lives, for them to understand the reminders from Jesus, through the Cross, with the gestures, with the small actions that He does for mankind. Without the eyes of faith, people will not be able to see the signs that He reminds to each person, for each person to be able to stay away from sin, for each person to come back to Him to receive mercy in these remaining days, the mercy which He constantly reminds people of. He comes to this world through the messages that He gives, through the prophets and through the revelations, to remind people to come back to God, to remind people to come back to the truth, for them to receive what is due to them from their efforts. This is the reminder in this Tenth Station of the Cross, for those who are listening to the words that Jesus Himself has revealed to L., for L. to relay for 2013. O Jesus who had accepted to be nailed to the Cross for my sins, give me the grace to also be nailed to Your Cross lest I commit more sins. Jesus had reached the end of the Way of the Cross. He had offered His hands to be pierced by the sharp rusted nails. Jesus had known about the excruciating sufferings upon His human Body, His muscles torn by the cruel treatment of the soldiers who wanted to make Him suffer exceedingly more. One more time, Jesus was supported by His divinity. He had accepted the excruciating sufferings He had to endure in this moment and in the last moments. Jesus reminds again that He had accepted all the sins of mankind, from within their souls, from the wicked thoughts in their minds, as the marks of the nails in His hands. If people truly live in righteousness and in truth, knowing God, then they would know what is right, what is wrong, what is wicked, and what is righteous, for them to stay away from sin, and for them to receive the graces that God gives to every righteous person, but today’s world is in such a deplorable state. 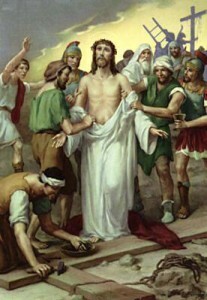 People do not use the sharp nails that were used to nail Jesus, and they do not use the ropes that were used to scourge Him until His Body was covered in Blood, but today, people use their minds to promote sins, to lure souls through the sophisticated snares of darkness, to lure each soul in the world. Through the necessities that people consider as the modern ways of the time, through the radical needs for the use of the machines, and through the movies, through the games, people are being lured and manipulated into committing sins, so when they fail to think clearly of the proper ways to use the technology that is available to them, then they have fallen into the snares of the devil. These are the sins committed in the minds of the people, and these sins continue to be committed more and more in today’s societies. From the righteous souls, to the priests and even to the children, all are in the same situation, caught in the snares of the darkness, from the latest technology, from the movies, from the games. Jesus had known about this era. He had seen the people falling into these situations, not knowing that they are committing sins, not knowing which way to follow in their lives, not knowing which way is sinful and which way is not. It is so clear, and yet people do not recognize it. That is the reason for Jesus to be nailed in His right and in His left, for the sins committed. Jesus had been nailed to take away the sins that were committed, the sins that are being committed, and the sins that will be committed, with the situations that are getting worse in today’s world. Everything that Jesus did had a reason, for the world to recognize and to see, for each person who truly listens to the words from God to ask themselves whether they can use what they need in a proper way, controlling their minds and their thoughts, so that they will not fall into the sophisticated snares of the devil in today’s world. No one can escape from the enticements when their minds become obsessed with them. Jesus wants to remind people of the sins that all ranks of people are committing, whether voluntarily or involuntarily. There have been many cases in today’s societies. Families breaking up because the husbands fail to take care of their wives and their children, because they are spending time with the games, spending time at their computers, watching dirty movies, that lure them into sinful thoughts and actions, leading them to think of the machines as their companions, as their love, instead of having loving gestures to show their love and affection for their families. Once people have been lured into the use of the machines, they distance themselves from God, they distance themselves from the truth, and they distance themselves from the realities of life. They forget their responsibilities, they forget their consciences, they forget their duties as a father, as a husband, as a brother, and they only look for the attractions provided by the machines. From one person to the next person, they continue to make mistakes in this way. People live in a society that is surrounded by the darkness through the use of machines, which they cannot see and cannot recognize. People forget about the love, the affection, and the teachings they should give to the children. They forget the works that they need to do, the words, the actions, and the gestures from their hearts, to show their support to their families. Instead, the way they are teaching their children is through the use of machines, through the use of games, through the movies, without any feelings, without any love, so then in their early years, the children are learning about violence from the games, from the movies. It is the lack of responsibility from the parents that is leading the children into sins. When the children grow up and interact with society, their minds are already influenced by what they have learned from the parents, and from there, they are quickly attracted by the violence that will lead them into committing offensive acts against moral principles, into ignoring what is righteous, and into being indifferent to what is considered sinful. In this world, there are so many problems among the youth, which were caused by their parents who, voluntarily or involuntarily, had poisoned their minds. But these parents did not recognize their mistakes, they suffer when their children end up in jail, they lament when their children end up being killed, and they cry when their children commit violent acts and hurt others. There are so many situations in which the people do not see the reality in their lives, which God is reminding through the Stations of the Cross for 2013. God reminds people that He had suffered for the sins of mankind. He had known in advance about the events that will happen, but this is the invitation in these end times. God wants to go deeper into the hearts of people. God wants to go deeper into the sins that people are committing, to see the truth. He calls people to come back to their duties, to their responsibilities; to be a father, to be a mother; to do the things they need to do, in the enlightenment of the Holy Spirit; to continue to pray and continue to receive the graces of Jesus Christ, through the recognition of each person. The righteous people will definitely receive righteousness. This is what God had given to mankind ever since. People need to trust that for everything that they cannot do in their human capability, with the grace of God, though they cannot see the results, everything will end up perfect. God only wishes that people will accept, will obey, and will follow His teachings. For each person who lives in righteousness, the Holy Spirit will help them to see the things that they need to know and will help them to see the things that they need to do, so that they will be on the right path, facing their own situations in this modern time, without being influenced by their own way of thinking, or by their own sinful ways. This is the reminder that God wants L. to report in this Eleventh Station of the Cross. Jesus was completely exhausted. He could hardly breathe. He looked down. He saw Blessed Mother, Saint John, and all the people who loved Him at the foot of the Cross. He had known that everything would be accomplished so He had entrusted His Mother to Saint John. This was clearly reported in the Gospel. In this last hour, He had lifted Himself up to God the Father, and He had prayed to accept all the sufferings upon His Body. All that had been written down in the Gospel has deep meanings that Jesus wanted to remind the generation back then, and today’s generation. He had seen and He had known about the sins for which He had sacrificed His life, to the last drop of Blood and Water, to pay the price for the salvation of mankind. For mankind, God had offered everything of Himself, from His humanity to His divinity, to endure the most atrocious sufferings, for mankind to see and to recognize the Love of God, through the Cross. As His last reminder before He breathed His last breath, He had looked down upon His loved ones, to remind today’s generation that for every sin that is committed, God is agonizing on the Cross. When people start to step into sin, Jesus is looking down to see what will happen to them, to see whether they will be able to know the consequences of their actions, whether they will be able to know that they have been deceived, whether they will be able to know that they are committing sins. God could see the horrible and frightful sins that people commit, to themselves, to others, and to humanity. People offend God the Father, they even provoke Him, and there are many other offenses that people do not even know that they are sins. This is the most frightening fact, when people commit sins and they do not even recognize their own sins, they do not even recognize that they are surrounded by the darkness. They could take a look at their sinful ways, in order for them to recognize, in order for them to end their offenses, so that they will not have to bear the weight of the consequences of their sins and the path that they have decided to take. It is indeed a pitiful sight, for this society and for this world. God had died, and up to the last minute, He had prayed to God the Father: Please forgive them, for they know not what they do. Today, God continues to repeat this prayer over and over again, to pray for God the Father to be merciful to this world. But the more Jesus prayed, the more He suffers for the sins committed by the people who do not even know of the accomplishments that He Himself had done. Jesus had asked and because of Jesus’ prayers, God the Father had waited and had refrained from the decisions He would have made, for people to understand the truth of their own choices. As in the past years, as well as for the remaining years, the invitation is still the same today, Jesus’ invitation from the Cross in His last hour. He reminds people through the priests, who are the ones to bring His words to today’s generation, to invite everyone to step away from sins, to bring them back to the truth, to explain everything about the Passion that Jesus is suffering for mankind, that He is suffering for each person who commits sin, that His Blood had been shed for each soul to be redeemed, and to be sanctified in the grace of God. There are so many blessings reserved for this era. God is truly Present, to remind and to invite people to come back to God with faith, but people are still hardened; they follow the modern ways of the world. They do not know that if God had not intervened, the darkness and the devil would have harmed each soul, would have taken the soul to a place where there would be no way out, because that is the place that the soul has chosen to be, when the soul commits sins. It is truly bitter for Jesus Christ who had to suffer for mankind, for mankind to still reject Him, ignoring everything that He had done 2,000 years ago. Today He continues to come, to be close to the people. He is alive in this world. He comes through the Holy Eucharist, and He is clearly Present for the people to see that He is alive, that He is coming to this world to invite and to bring everyone back, and for everyone to recognize the graces of His Love through Divine Mercy. O priests, O Church, and all the people of God, listen to the words that Jesus reminds everyone in 2013. He reminds everyone to look at the works that they do, the offenses that they are committing, and the decisions that they need to make in order to come back. O priests, be prepared to preach for the people to listen to you, for them to find their way back to God, for them to reconcile with God, to receive forgiveness and salvation for their souls, for whom Jesus had shed His Blood to pay the price, to bring these souls back to Him. There are so many things that Jesus Christ keeps reminding this world. Come back and trust in God. Everything that comes from the Light will shine through the people that He had chosen, for Him to be able to come closer to the people so that they come closer to the Gospel; to come closer to all nations. Though the revelations are given to the laity, these revelations are true and the people have to listen to these words from God. Jesus was close to breathing His last breath on the Cross. In this last moment of being close to His Death for the sake of mankind, His plea to God the Father was for mankind to have the opportunity to repent; for mankind to have the opportunity to come back to receive the joy and the glory for which Jesus had sacrificed; for mankind to have the opportunity to recognize the Light; and to have the doors of heaven open wide to welcome those who live in righteousness, to welcome those who reject sins, for them to be worthy to receive the forgiveness that Jesus is reminding to everyone, through the 14 Stations of the Cross of 2013. Jesus had died. Everything had been accomplished in the way that He had been aware of, in His divinity. Everything had been written down clearly in details, but today, Jesus allows me to write the things that He wants to give to the world. So these are the words that Jesus wants me to continue to report about Him being taken down from the Cross. When Jesus was taken down from the Cross, His Body was a dead body just like any other human being’s body at their own death, lying there for the people who are alive to do what is needed for the burial. There was not one drop of Blood or Water left in His Body. The wounds from the scourging had dried up. There were deep wounds all over His Body from the cruel scourging, and on His head, there were the deep wounds from the thorns. Once Jesus breathed His last breath and was taken down from the Cross, He was completely unaware of anything else. Blessed Mother was the first person to receive the Body of Jesus into Her arms. Blessed Mother was just like any other mothers on earth. How she suffered to see the tortured Body of Her Son. He had to suffer so much, for whom? How Her Heart agonized when She held Him. It was impossible for Her not to cry, it impossible for Her Heart not to bleed, when She thought of the past, when Jesus was alive, living in the same house with Her, talking, laughing, teaching, praying, just like any other child. The memories of the intimate life with Jesus were on Her mind when She held Jesus in Her arms. O such bitterness, but Blessed Mother had given Her “Fiat” right from the moment of the Incarnation of Jesus, and She also had given Her “Fiat” when Jesus was taken down from the Cross. Everything came back to Blessed Mother’s memory as in a movie, along with the sufferings of not having His presence by Her side. Blessed Mother could have died with Jesus on His Way of the Cross from Her sufferings, but by the grace of God, She had the strength to keep Her “Fiat,” for Her to be the Co-redeemer (8) with Jesus, and for Her to have peace in Her Heart to receive the Body of Her Son. No one could ever describe or understand how sorrowful Her Heart was at that time. At that moment, with the heavenly perspective that She received from God the Father, She had the strength to accept Her “Fiat,” which was also the wish of Jesus, for Her to put aside Her feelings as a human mother, for Her to accept and to endure the ultimate sufferings from Her Heart, for Her to co-redeem with Jesus in His Passion, so that from the sacrifice of Jesus, and from Her own sacrifice, the people could see the love that She and Jesus had for mankind. Everything happened as God had arranged, and that also was for the world to see the relation between people and their loved ones. When a person sins, the consequence of the sin does not affect only that one person, but always involves the people around who are the father, the mother, the brothers, and the relatives. Among these people there are those whom we love, there are those who have made us suffer, there are those to whom we have to be grateful. So we have to remember that we are hurting the people who are close to us with our sins. Those who are fathers and mothers also need to make sure that they accomplish their duties and responsibilities as parents. They need to teach their children to stay away from the actions that they recognize as sinful, and if they fall into sin, they need to understand that their future will end up with many sorrows, not only for themselves, but also for those who are close to them. These are the advices that God is giving our society today. O people who are living in this world, God is giving special graces with the revelations, reminding every rank in society, reminding the children, reminding the parents, for everyone to be on the same path, for everyone to find the ways to avoid the offenses in this present life. Do not forget about the sufferings that Jesus had endured up to the last minute, for mankind to see the accomplishments that He had done, until this day. Only Jesus could have accomplished what He did for mankind. Only Jesus could have sacrificed for love. His Love gives eternal life to mankind; His Love opens up the doors of heaven; His Love brings the Light of Truth to mankind, for everyone to feel peace in their souls, in their minds, and in their bodies, and for their souls to find a place to go to after death. From the beginning, till the end, Jesus had accomplished everything that would be beneficial for mankind. He had shown the way by His example. He had prayed to God the Father for people to have the opportunity, in every situation, in every adversity, if people truly recognize and accept God. Those who are parents have to find a way to guide their children to learn about righteous things, and to guide their children to avoid committing sins. The parents need to avoid the situations where there could be a lack of responsibility, and they need to take care of their children daily, with love, teaching their children about the truth, for their children to know about God, for their children to know about the things that they need to do, for their own good, for their bodies, for their souls, and for their minds. This is the Thirteenth Station of the Cross that Jesus Himself gives to L. to report. At this Fourteenth Station, they had prepared to take Jesus to the tomb for the burial. 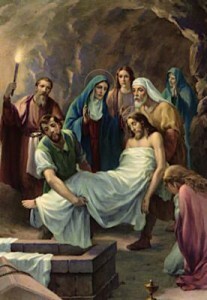 After Joseph, Nicodemus (9) and John had taken Jesus down from the Cross, as was in the Jewish tradition at the time for the embalmment and burial, they had cleaned His Wounds, they had put perfume on the Body, they had covered His Body in the shroud of linen, and they had buried Him in the tomb. Jesus had thus completed His mission for the salvation of mankind, which He Himself had accepted, and had accomplished. Through this ordeal, Jesus had reminded us that in any society, there are wicked people but there are also just people. The just people are the ones who are bringing the brothers back. They are able to find the truth, and they have seen the truth with the eyes of faith. In this world, there are many people who are living in sin, who do not know that a spiritual life is greatly needed for their souls, who are enticed by the lures of the world, by their passions for status, for money, for fame. They do not think of the future for their souls and for their bodies. On the other hand, there are people who have been able to find the truth, who can see the evil in the world, the immorality in society, the violations against the laws, the commandments, and the statutes of God. There are also certain people in power, who, in the beginning, act with respect for the commandments from God, but then end up doing things according to their ego, doing things for their own interests, and making decisions that affect the whole world. Their decisions are not made by mistake, they purposefully make decisions that are against the commandments, and their wickedness is clear. In this world, there are many just people, but there are also many sinners and many wicked people. Jesus reminded us also to be good examples for our children and for our grandchildren, for our communities, to show compassion and virtuousness when we can truly recognize the things that come from God. Our love, like the perfume He (10) described, and our pure hearts, rejecting sins, are similar to the linen wrapping His Body. Jesus had suffered a cruel scourging, but then there are the people who are similar to a clean piece of cloth, who will console Him, and who will clean His Wounds. Like the clean pieces of cloth in every era, there are people who live worthily in the gratitude of God, and who have found the Light, firmly in their lives. They are but a very small number of people in the world, but no matter where or in what situation, though their number is not that significant, in the eyes of God, they are the light that God wishes to see in this world. God always invites and God always supports those who are willing to be of service to others, of service to their community, living a life not thinking of their own self but to serve the brothers, to bring the truth to the brothers whom they meet, to help bring the brothers back to God. God has clearly seen the people who live a simple life, who are not learned but who have a devoted heart, seeking humility in a life that is for the others to clearly see. There are those people who are learned and who have power, but their faith and their love for God is limited, for they only believe in their knowledge, and they do not believe in the truth, in the true events that are happening in these end times. Jesus is working in every era, and with faith, people will be able to see the works of Jesus in the people whom everyone can see, though they are very simple people. If looking only at the appearances, then there is nothing to show that these simple people are learned and have a wide knowledge, but their hearts are truly seeking God, their hearts are simple in regards to all things concerning God. They do not have any motive, they do not have any wicked intentions, and they do not have any expectations when they receive the graces that God gives to them. They work silently, and they are the examples for others to see and to follow. Throughout the centuries, God had given revelations to the humble people, to the simple people, so that through them, God gives to the world. Today is also a reminder for people not to overlook the things that are true in this world. It is true that God is using these simple people, to come to all the brothers in Christ in the world, with the messages. The things that come from the truth are everlasting, so use the eyes, with love, and use the heart, to pray to the Holy Spirit for the guidance to know whether something is true or false, and whether it comes from human thinking. It is quite simple to look at the work that is done by each person who is at the service of God. Even if a person does not know anything, but when they receive the grace from God, they are able to do extraordinary things, for everyone to see that God is truly present in this world and that God is working in the brothers in Christ. When everyone opens up their hearts and they live in sincerity with God, they will be able to know and to see the revelations that God gives to them, which will bring many benefits when they lend a hand to spread the messages that Jesus wants to send to this generation. Completed reporting the 14 Stations of the Cross at 12 p.m.
(1) St. James the Less, Apostle, and St. Stephen, deacon (the first Christian martyr), were both stoned to death. (2) This refers to God’s laws, especially to love God with one’s whole being and our neighbor as ourself – not man’s laws. (3) For those who have died, they see this truth in the hereafter; for those still alive, they see this truth now. (4) This seems to be a reference to the altar cloth called a purificator used by the priest in successive centuries to wipe the chalice of the Precious Blood. (5) When Jesus gives L. messages it is as a loving Father to His children. This spiritual fatherhood of Jesus is seen in John 13:33, John 21:5, Matthew 23:37, Luke 13:34 and Mark 10:24, and likewise in a message He gave to St. Faustina: “If only they could understand that I am the best of Fathers to them (…).” (Diary, 367) For more on this please see our homepage at www.nrtte.org . (6) This sentence speaks of the situation in which one or both parents are following God but the children are not. (7)Though Jesus’ human, earthly suffering is over, His divine suffering continues every time we sin because there are no limitations of time or space with Him – God lives in “the eternal now.” God, because of His infinite Love for us, suffers every time we sin. (8) Our Lady as Co-redemptrix (“Co-redeemer”) is Catholic doctrine. It is the teaching that She uniquely participated, with and under the Redeemer, in the redemption of mankind by freely cooperating in Her Son’s life and works. Her co-redemption began when She gave her “Fiat” at the Annunciation and progresses to the Passion, when She again gave her “Fiat” and acquired, with and under the Redeemer, the graces of Calvary. (9) Joseph of Arimathea and Nicodemus, two Pharisees and members of the Jewish Sanhedrin who believed in Jesus, as recorded in the Gospels. Both have been canonized by the Church.